Robin Williams lived an amazing life before his death one year ago today, August 11. In the beginning of his career, Williams struggled as a street mime in front of New York’s Museum of Modern Art; by the end, he was the type of performer who could lift the spirits of a long-time friend in the hospital to our nation's troops in Afghanistan, Iraq and Kuwait and everyone in between. Moreover, once Williams reached the top, he remembered to look back on where he came from: The actor famously helped Jessica Chastain become the first person in her family to go to college, funding her full-ride scholarship to Juilliard when she was just starting out herself. Below are some of the little known moments of Williams' inspiring career. 1. Robin Williams improvised most of Genie for "Aladdin." Initially they came in and I was just doing the scripted lines and I asked 'Do you mind if I try something?' and then 18 hours of recording later, they had the genie. I just started playing, and they said "just go with it, go with it, go with it." So I improvised the character. I think that in the end, there were something like 40 different voices that I did for that role. Williams was known for improvising most of his iconic roles in some way or another. 2. Robin Williams dressed in scrubs and surprised his friend Christopher Reeve in the hospital following his career-ending accident. Then, at an especially bleak moment, the door flew open and in hurried a squat fellow with a blue scrub hat and a yellow surgical gown and glasses, speaking in a Russian accent. He announced that he was my proctologist, and that he had to examine me immediately...it was Robin Williams...for the first time since the accident, I laughed. My old friend had helped me know that somehow I was going to be okay. Williams later surprised Sharon Osbourne in a similar way after she was diagnosed with cancer. 3. During the filming of "Schindler's List," Robin Williams called Steven Spielberg to tell him jokes and lift his spirits. Spielberg called these "comic care packages over the telephone." 4. 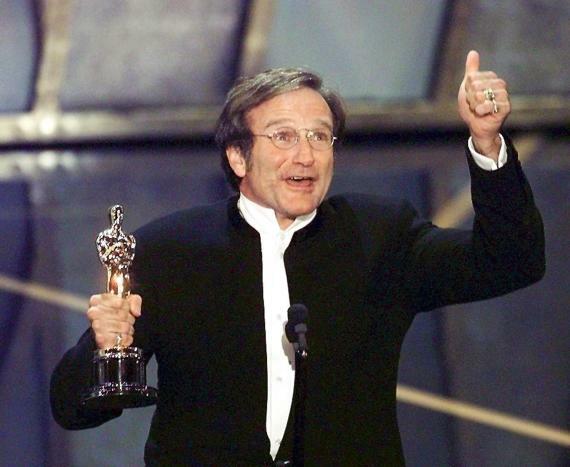 In high school, Robin Williams was voted by his classmates as the "Least Likely To Succeed." Williams attended Redwood High School in California where, during his senior year, he was voted both "the funniest and least likely to succeed." Later in life, Williams would win five Grammys, two Emmys and an Academy Award. 5. Robin Williams' favorite childhood book was "The Lion, the Witch, and the Wardrobe," which he'd read to his kids. All images Getty unless otherwise stated. So sad so very sad about Robin. My head and heart extend to his family.